From Monday 6th December to Tuesday 7th December 2017 MOD Theatre Group’s Chris Thomson and Gary Faulkner came to our class to help us prepare a show for local pensioners at the Abbey Centre in Great Smith Street SW1. 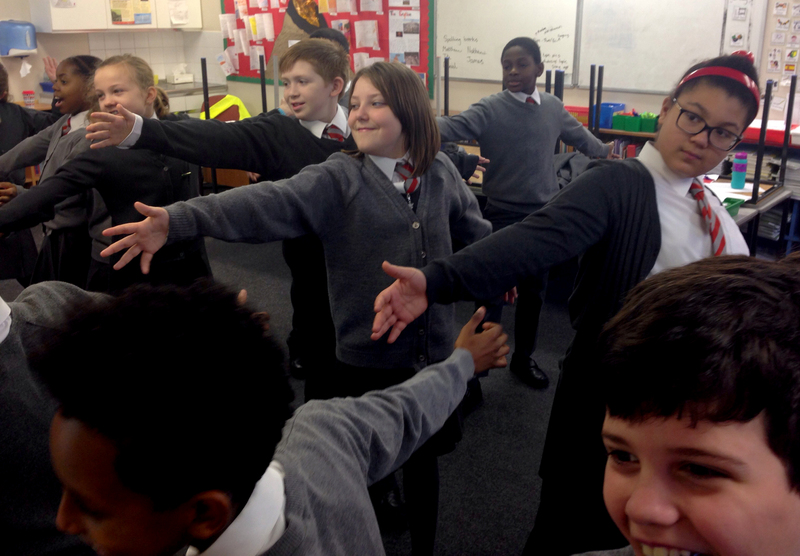 it was great fun and we loved learning all of the songs that went with the drama scenes we learnt. 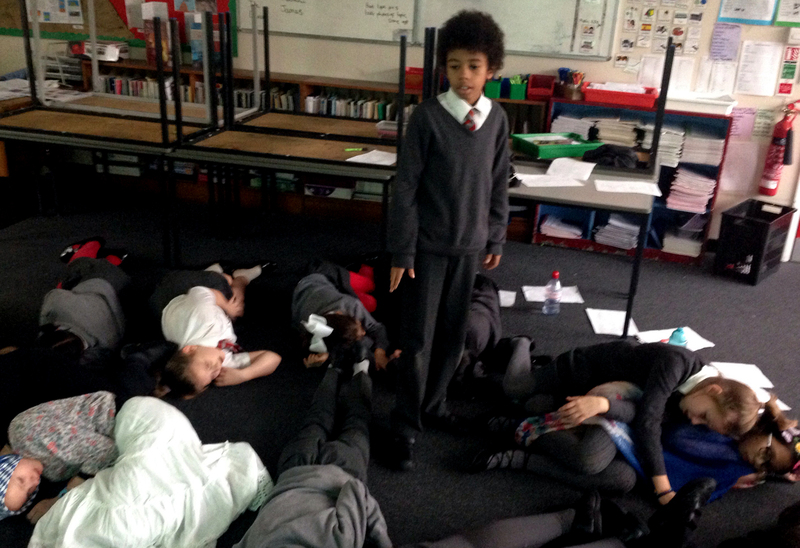 Gary and Chris worked with us to dramatise what happened on 1st July 1916 when 20,000 British soldiers died in just one day. Our show was based around the story of Westminster Council dustman Private Ernest Boots, who was killed on the 1st July 1916. Peter from Westminster Archives came into our class and used documents from the archives to teach us about this story. Ernest was born in Belgravia in 1883. People born there today would be quite rich but Ernest’s family was poor. His father was a carman-the white van man of Victorian London so the family flitted from one home to another when Ernest was a child. Gary taught us a song that families like the Boots knew that met with this experience. It was called, ‘My Old Man Said Follow the Van’ and described how some poor Londoners had to escape from the rentman by disappearing in the night with all of their belongings. We heard how Ernest married his sweetheart Sarah and how they lost their first child before going on to have five more children. We then looked from Ernest’s army record to piece together his story. We thought it was very sad how he died and how this forced Sarah to leave London. We thought more should have been done to help the family. We were very nervous about the performance as we had two performances. The first was the most nerve racking as it to the local pensioners from the Abbey Centre. 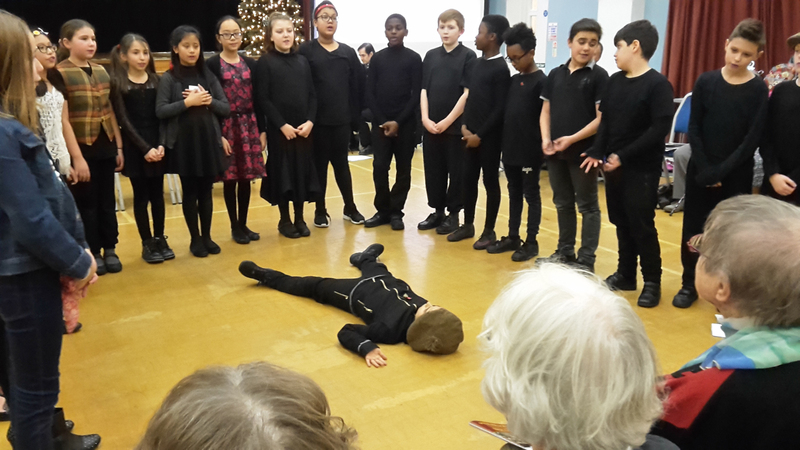 they loved our performance and joined in singing songs like ‘Bombed Last Night’ ‘Tipperary’ and ‘Goodbyeee.’ We made a few mistakes but they didn’t mind and it meant we were ready to perform to our parents in the second show. Miss Lee our teacher was very pleased with us. By taking part in the drama it helped us appreciate what life must have been like for ordinary people from our area in WW1. 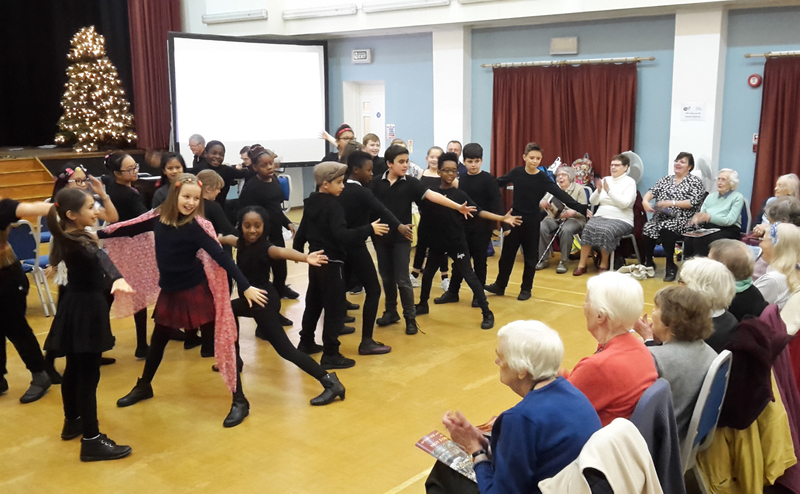 The pensioners from the Westminster Community Reminiscence and Archive Group came to watch our show at the Abbey Community Centre, Great6 Smith Street SW1 on Wednesday December 8th 2016.